Government agencies and businesses, large and small, are in a unique position to lead the recovery following a disaster. From first responders providing emergency relief, to local grocery stores operating on backup generators, to pharmacies using backup data networks to maintain operations, disaster ready organizations hold the key to enabling the communities in which they operate to withstand disaster and return to normalcy as soon as possible. Small businesses and government agencies can learn from the example of larger enterprises. During the aftermath of Hurricane Katrina in 2005, for instance, Walmart used its satellite broadband network to enable local pharmacies to act as a community resource. As a result of its preparedness, Walmart was able to quickly offer access to life-saving medicines, food, and basic supplies. According to a survey of small businesses located in the Gulf Coast region, in the aftermath of Katrina, 37 percent of those surveyed were without broadband service for more than five business days and 25 percent of those businesses reported losses of more than $25,000 due to their lack of Internet connectivity.1 Businesses, government, and the communities they serve cannot afford this downtime. A disaster-ready organization will be able to recover faster and suffer less financial loss. Even more importantly, a quickly recovered organization is good for the local economy as it enables employees to return to work more quickly. According to researchers from John Hopkins and Texas A&M University, during the last five major hurricanes, nearly 30,000 businesses and government entities were forced to cease operations due to power outages and loss of Internet connectivity.3 During such weather events, business and government offices can expect to experience network downtime, impairing emergency response and recovery efforts, disrupting business activities, and impacting the ability to keep mission-critical operations running smoothly. The best time to respond to a disaster is before it happens. Every area in the country is subject to disaster  whether natural such as a flood, hurricane, earthquake, ice storm, or landslide  or man-made such as an oil spill, civil unrest, or a terrorist attack. Even areas that have never suffered from a disaster in the past have no sure protection from potential disaster and devastation in the future. With a relatively small investment of time and money now, businesses may prevent disruptions in the future. Clearly, a disaster-ready organization will recover more quickly and suffer less financial loss than one that is unprepared. Taking proactive steps toward preparedness contributes to the health and well-being of the local population and to an expedited economic recovery that can re-energize the community. Equally important, organizations that recover quickly help pave the way for employees and the greater community to return to work as soon as possible. As a result of the companys experience in assisting businesses and government agencies with disaster recovery operations, Hughes has compiled a list of simple steps that can help enterprises, government agencies, and small businesses stay connectedhelping to minimize losses and eliminate Internet downtime in case of disaster. Maintaining electrical power is a top priority for business and government sites. Without electrical power, organizations cannot support an Internet connection for their emergency data and voice communications. Additionally, a backup generator is essential for supporting refrigeration, lighting, and security systems in the event of a power failure. In hurricane-prone areas, many companies are making backup generators an essential component of their business operations. For example, Publix, a Florida-based grocery chain with about one-third of its stores located in hurricane-prone areas across the Gulf States, initiated a program to install generators in these stores. During previous hurricane seasons, power outages played a major role in the losses the stores experienced. Although each store was equipped with a backup generator, it did not provide enough power to keep the stores open for customers, and run coolers and freezers to prevent food spoilage. As a result, in 2006 the company announced an investment of $100 million to purchase higher power 500- watt generators to protect Publix stores in nearly 575 communities. According to the U.S. Department of Labor statistics, more than 40 percent of all businesses that experience a disaster never reopen and more than 25 percent of the remaining companies close within two years. These failures are due in large part to a lack of planning, which results in the loss of critical business data. Developing a disaster recovery strategy is a critical undertaking for any organization. It is essential that businesses and government agencies evaluate which applications and data are vital to their operations, such as point-of-sale, accounting, logistics, inventory, and services to the public. Back-up and storage of critical information should be performed routinely and in a timely manner, using a safe, secure, an dependable facility. Since data may be lost due to flooding or fire, consider storing data at an off-site location or centralizing data storage at a headquarters data center. Consider the amount of time, money, and effort it would take to recover a system whose files are destroyed by mechanical failure, a virus attack, or user error. In addition, consider the losses that would be sustained simply because of downtime. When disaster strikes, terrestrial networks are most vulnerable to failure  dial-up, DSL, cellular, and cable can be down for hours, days or even weeks. A satellite broadband service, on the other hand, offers an alternate communications path enabling organizations to maintain critical applications when terrestrial networks fail. Broadband satellite services provide network connectivity that continues to operate when terrestrial networks  including cell towers  are severely damaged. Incorporating satellite services into emergency planning and response activities enables businesses and government agencies to maintain uninterrupted Internet connections needed to facilitate disaster response and day-to-day operations such as sending and receiving emails, processing orders, sharing information, and checking inventory. 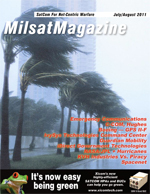 Hurricane Katrina, for example, aptly displayed the need for organizations to protect their mission-critical information in the event of terrestrial network failure. Because it provides instant infrastructure wherever needed when terrestrial networks are severely damaged, satellite communications allows organizations to continue conducting day-to-day business. When in jeopardy of losing service for an extended period of time, put remote site managers on alert to support the organization and its data during and after the disaster. With a solid disaster recovery plan in place for each location, organizations will be better able to successfully weather a disaster and avoid being out of reach when communications are needed the most. As the worlds leading provider of broadband networks and services, Hughes can accommodate virtually any emergency communications need. Its extensive portfolio of offerings includes solutions for emergency preparedness and emergency response, ensuring rapid deployment after an emergency occurs. Hughes broadband satellite service is scalable and deployable from across the city to across the nation. The Hughes suite of Emergency Solutions features an Internet service plan with download speeds of up to 5 Mbps and upload speeds of up to 1 Mbps, made possible by using Hughes advanced SPACEWAY® 3 Ka-band satellite system. The service plan includes comprehensive 24/7 technical support, next-business day field maintenance, and provides organizations with the flexibility they need in an emergency, requiring only a two-month service commitment that may be extended on a month-to-month basis, depending on need. In addition, a range of options are available for fixed and mobile solutions, including Inmarsat Broadband Global Area Network (BGAN) mobile satellite solutions. Bandwidth requirements are sized as the job dictates for efficient management of resources and budget. Moreover, Hughes operates highly secure satellite network management centers across the nationa true alternative infrastructure that stays up and running when terrestrial systems fail. After an emergency occurs, Hughes Emergency Solutions provide a true alternative infrastructure that stays up and running when terrestrial systems fail. Businesses and government agencies nationwide are employing Hughes Emergency Solutions to protect their organizations. For example, the Florida Emergency Management Agency (FLEMA) uses Hughes satellite technology to power an alert system to warn citizens when potential emergencies threaten. The solution covers more than 100 state and county fixed sites, as well as three mobile units. The Pennsylvania Emergency Management Agency (PEMA) employs an advanced Hughes broadband satellite solution to provide path-diverse backup communications when its terrestrial network fails. The statewide solution connects more than 100 sites, including police, health, and county emergency operations centers. Similarly, Cabelas, the worlds largest outdoor outfitter, employs a high-performance Hughes broadband satellite backup solution to ensure uninterrupted service at its stores. When a remote site detects a primary connection outage, the Hughes service automatically engages and switches all data traffic to the satellite network to keep the store up and running. By being prepared for emergency situations, businesses and government agencies  large and small alike  can avoid costly downtime, help secure the long-term health of their organizations, and play a major role in assisting their communities to recover as quickly as possible if disaster should occur. Anthony Tony Bardo has 29 years of experience with strategic communication technologies that serve the complex needs of government. Since joining Hughes Network Systems in January 2006, Bardo has served as assistant vice president of Government Solutions, where he is focused on providing Hughes satellite broadband applications solutions to Federal, State, and Local governments. Bardo also recently served as Chair of the Networks and Telecommunications Shared Interest Group (SIG) for the Industry Advisory Council, an advisory body to the American Council for Technology (ACT). Before joining Hughes, Bardo was with Qwest Government Services for nearly five years where he served as senior director of civilian agencies sales and marketing, senior director of marketing, and senior director of business development. Prior to Qwest, Bardo spent 14 years with the government markets group at MCI where he held the position of executive director for civilian agencies. During his tenure, his teams managed programs with the Federal Aviation Administrations national air traffic control network, the Social Security Administrations toll-free network, the U.S. Postal Service Managed Service Network, and the U.S. General Services Administrations FTS2001.